Reviews have become more important than ever before. When booking a table at a restaurant, with online shopping and also when choosing a campsite, reviews often play a decisive role in a person’s choice. ACSI, therefore, wants to work with you to ensure that more campers post their reviews on Eurocampings.eu. It is not only advantageous to the campers, you will also benefit from good, up-to-date reviews about your campsite on the ACSI websites. One of the ways to get more reviews this season is by using the ACSI review display. The inspectors who will be visiting you this summer will bring along a small review display with flyers. You can place this at reception. Campsite guests can take a flyer and will therefore be reminded to post a review when they are at the campsite or when they arrive home. With the review display, both campers and campsites can win a prize. 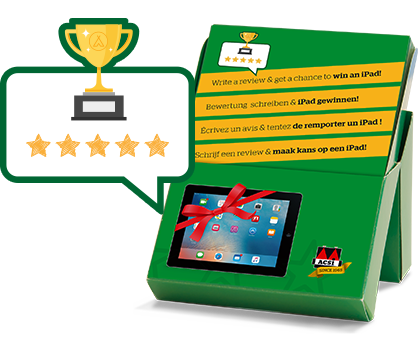 Campers who post a review on Eurocampings.eu based on the flyer have the chance to win an iPad. Of all the campsites participating in this campaign, the campsite with the most reviews in their region has a chance of winning a free banner on the campsite’s regional page on Eurocampings.eu (worth € 350). For more information go to the promotional terms and conditions. There are, of course, more ways to get reviews from campers. You can read more about this in the ACSI Times published this spring. The campsite with the most approved reviews in its region shall win a regional banner on the Eurocampings website. This banner shall be displayed for two weeks. To be eligible for the prize, the campsite must have obtained over twenty approved reviews. The promotion runs from 1 March 2018 to 21 December 2018. Campsites are not permitted to review their own campsite. With any doubt, ACSI has the right to exclude the campsite from further participation. All other reviews left from the start of this promotion shall also be deleted. Double reviews only count once and shall only be published once. The number of reviews that count, is the number of reviews published on the website from the start of the promotion and with the promotional code. The reviews must meet our general rules for posting a review and must have been approved by us. A maximum of 425 banners shall be given away among all campsites that have collected twenty or more approved reviews by taking part in this promotion. The campsite with the most approved reviews in its region shall win the banner. There shall be one winner per region. The draw shall take place on Friday, 21 December 2018. With an equal number of reviews within the same region, a draw shall take place to determine the winner. Any designation of the winner through a draw shall take place impartially through selection by computer from the campsites that have ended up with equal number of reviews. The result is binding and no correspondence shall be entered into about the result. The winning campsites shall be informed by e-mail and they have until 28 February 2019 to deliver the requested materials and the link behind the banner. By participating, the campsite gives ACSI permission to announce the winning campsites via other channels. The prize is campsite specific and not transferrable and cannot be exchanged for money, services or goods. The prize, hereafter referred to as ‘the banner’, consists of a banner that shall be displayed on regional level on the Eurocampings.eu website. The size of the banner is 300x250 (medium rectangle). The banner shall be displayed for two weeks in the month of July 2019. The banner shall be shown at a regional level, if no region is available the banner shall automatically be displayed on a country level. The banner contains the (main) photo used on the detail page of the campsite on the Eurocampings website. The banner shall only be displayed in English on all language variants of Eurocampings.eu. The banner shall be made by ACSI. It is not possible for the campsite to supply a banner made by them. The campsite only provides a link. This link shall be placed behind the banner. If the campsite does not provide a link, or is late providing the link, then the link to the homepage of the campsite’s website shall be used. If the campsite wants to measure the effect of the banner, then campsite must ensure the link is provided with an UTM code (for example).